I think the title speaks for itself; pure, absolute indulgence. The idea of making them came from a friend of my dad, so I found the recipe online at lickthebowlgood.blogspot.ca – a great site for TONS of dessert recipes. The cupcakes are so chocolatey and rich; it is impossible not to take a bite out of one. I adore nutella, so when I found the recipe, I got extremely excited to test it out. It only has 3 ingredients! 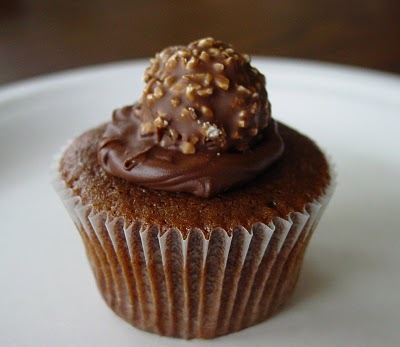 Topped with a cute decorative ferrero rocher, these cupcakes will have all your guests asking for the recipe! August 27, 2012. Tags: after school snack, bake, Baking, cook, cooking, cupcake, Cupcakes, ferrero, ferrero rocher, fun, nutella, nutella ferrero rocher, rocher, summer. Cupcakes. 8 comments.